To all those that are practically part fish out there: Yeah, you know who you are. The ones that can't stay away from water. The smell of chlorine gets your blood pumping and you all but grow fins. The water calls to you, beckons sweet nothings. And there you are, jumping in, yelling "Cannonball!" But a few days later, you come into my office complaining of ear pain. Well, stop it. Stop that water addiction. Your poor ears are ten seconds away from sitting you down for an intervention. But we all know your intense Romeo & Juliet relationship with water, so your ears will just have to suffer. Right? Well, not completely. So, let's talk about Swimmer's ear: what it is, how to identify it, how to prevent it, and how to treat it. Often even in medical settings, swimmer's ear, or in expensive medical terms, otitis externa is often mistaken for otitis media, which is an infection behind the tympanic membrane (ear drum) and it is mistakenly treated with oral antibiotics that don't do jack for it. Yep, antibiotics taken by mouth don't do diddly squat to treat it. This is where understanding the difference between the two main types of ear infections comes in handy. 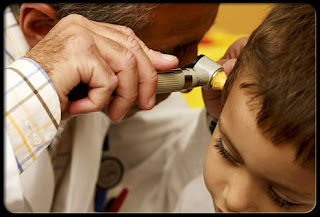 Otitis externa is an infection that usually presents with a swelling of the external auditory canal which is fancy and again expensive way of stating outside ear canal. Also, it will typically have white, icky gooey gross stuff drain out of it, in a condition called otorrhea, medical jargon for runny ear. Another characteristic is that the external auditory canal will often times swell shut, thereby causing a temporary hearing loss. Fevers may be present but rarely go above 101 degrees Farenheit (38.3 degrees Celsius). Other characteristics: Most common in the summer. Recent swimming. Pain is achieved by pulling on the ear. Otitis media is an infection with fluid and pus behind the ear drum. The condition occurs most commonly in winter months and is associated with a recent upper respiratory infection. Has a runny nose then think more otitis media. Children with it will often act more restless at night. 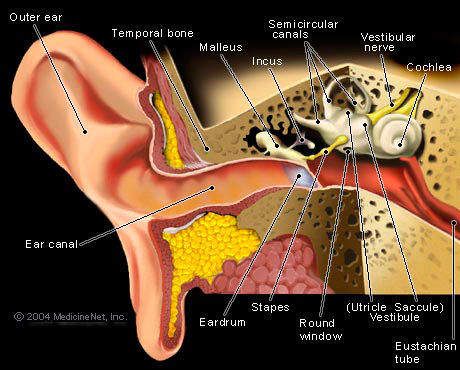 As far as drainage, the pus typically doesn't drain out the ear unless there is a perforation of the tympanic membrane. This occurs when the pressure behind the eardrum becomes so great that the membrane blows open like a pair of briefs after a burrito binge-fest, thus letting the pus go pouring out screaming "free at last!" But under normal circumstances, there is no drainage from the ear, unlike in otitis externa which runs a marathon. In addition to fevers, sufferers of otitis media most commonly have a dense loss of hearing that feels similar to trying to hear while under water. Speaking of drainage from the ear, the type of otorrhea can actually help you in diagnosing what type of ear infection or injury you have. Yeah, I know what you are thinking: "Ewe, I don't want to know more about diarrhea from the ear!" But come on, you know you're curious. It's like the trainwreck that you just can't help staring at. It has that so gross but so addicting thing about it. Pretty soon, you're going to start looking in people's ears, searching for waxy treasure and loving every minute of it. So here it goes: The low down and dirty of ear drainage. Fungal --- Fluffy and white like a kitten. But can be black, or bluish-green. Ahh, it's colorful. 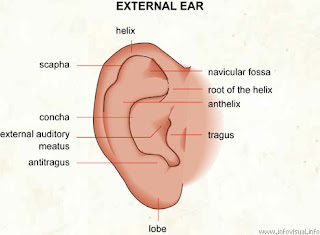 So before I get too technical, I might as well show you the anatomy of the ear. I'm only doing this for you. I, personally, really didn't like anatomy. I smelt like formaldehyde after each class. Parfume a' la cadaver bodies. Not good for the social life, so I'm a little bitter. But for you, I'll make an anatomy exception. There. That's my extent of giving you anatomy. Feel the love. Okay now, moving on. Sticking stuff in your ears like Q-tips, keys, toys, unlucky rabbit's feet, etc. Otitis externa presents like you've been kicked in the ear. The American Academy of Family Physicians states that the most common symptom is ear discomfort. But come on. How many of you mer-people will actually jump out of the water long enough to go to the doctor's office for "ear discomfort." Yeah, that's right. I see you in my office when you're screaming and crying, wailing and gnashing of teeth, because it hurts like a freaking sea horse kicked you in the ear... correction an itcy seahorse. Did I forget to mention the intense itching? Or pruritis, if you want to be technical. Itching = $5 word. Pruritis = $5,000 word. Doctors like to use the $5,000 word: it pays for our yachts, or in my case, my beaten up RV. So, in a nutshell: Ear discomfort (otalgia, another $5,000 word), which worsens with touching the ear or chewing, and ear drainage (otorrhea. Again, Cha-ching!). 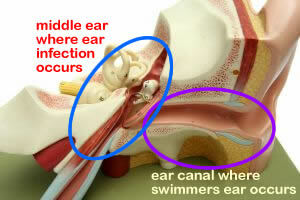 A bad case of swimmers ear can be so intense with pain though that the a patient may require analgesics. Patients may also complain of ear "fullness" and/or hearing loss due to the swelling of ear canal until it occludes the opening. Stay out of the water. Okay, that's not going to work. That's about as useless as saying to a room full of drug addicts: don't take this crack that I'm leaving here on the table in front of you, because it's bad for you. Next option, is to dry your ears after water immersion. Using a blowdryer to gently dry your ears is actually quite affective in preventing Swimmer's ear. The excess moisture in your ear, removes the natural protection of your ear's waxy secretions and thus increases the pH in the canal. This provides the optimal environment for growing bacteria and thus leads to infection. The most common bacteria that infect the outer ear canal are Pseudomonas aeruginosa and Staphylococcus aureus. Mix one part alcohol (rubbing alcohol, not beer) with one part white vinegar. The vinegar is acetic acid and provides the acidic part of the solution, while the alcohol helps to disinfect and dry out the ear canal. Apply 3 drops of this mixture to each ear after swimming to reduce the occurrence of infection.In fact, this little home remedy is similar to the expensive pharmaceutical treatments requiring prescriptions. My boss, Dr. Tacket is quoted to say, "Put nothing but your elbow in your ear." So literally, it means put nothing in there. No Q-tips, no keys, no bobby pins, no fingers, no toys, no bugs, no nada. Nothing. Zippo. One, you can damage the external auditory canal, making it much more susceptible to infection. Two, you push the ear wax down towards the tympanic membrane where it can get lodged and cause cerumen impaction, which results in a reduction of hearing. And three, I seriously don't want to dig out that junk out of your ears. It exhausts me. Granted, digging cockroaches and beetles out of people's ears exhausts me more, because I have to fight my gagging reflex the whole time and end up paranoid for weeks about a bug climbing into my own ear. Not fun, I tell you. Not fun. Then don't allow water in your ears. Where good fitting ear plugs while bathing or in the water. A cheap way of preventing water getting in your ears while showering is to put a cotton ball in your ear with vaseline on it (on the side of it facing outward). This acts as a water barrier. Then immediately remove the cotton balls or ear plugs from your ears once you are out of the water. I know, I know. I just said don't put anything in your ears. Well, ears plugs and temporary cottonballs dipped in Vaseline don't count. Oral antibiotics don't work for swimmer's ear at all, period. They only work if otitis media is involved due to perforation. But that's otitis media. The antibiotics that are useful are in ear drops or even eye drops. The antibiotics must come in direct contact with the bacteria on the surface of the ear canal for them to work. If the ear canal is swelled shut, you have to force a wick into it, which is a painful process, and then drop the ear drops onto the wick. You need certain instruments available that you can clean the infection debris out of the ear with. Six, never, never, never under any circumstances flush the ear with water or get water into the ear. Makes the situation worse like throwing gasoline onto an oil fire. Seven, oral antibiotics don't treat otitis externa. So let's discuss the treatment options and what you can do at home to help treat your loved one's otitis externa. The main treatment of otitis externa is topical. If the external auditory canal is not occluded, place antibiotic drops in the ear canal itself. Push the tragus (that small flappy thing that everyone asks why is that thing there in front of your ear canal) in a few times after administering the drops in order to further distribute the antibiotics within the ear canal. 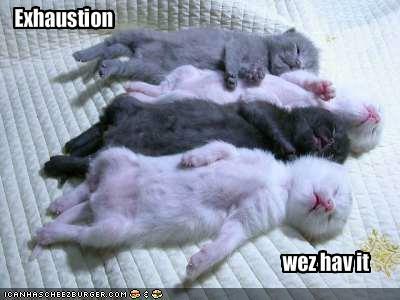 The symptoms should start to cease after 3 days. If the symptoms don't stop than the external auditory canal is most likely swollen shut and the antibiotics aren't reaching the infected skin. Insert wick using an otoscope (or you can use a headlight strapped to your forehead and a magnifying glass) into the infected ear canal. It will hurt the patient terribly, so be prepared to be beaten. Give the patient pain killer before proceeding. Ear wicks are made by several different companies, namely Otocell and Americell brands. After inserting the wick, then apply the ear drops to it. If a wick is required than the drops should be applied every 3 to 4 hours while patient is awake. After a few days (2 to 5 days), pull the wick out and reexamine the ear canal. Redo this process every 2 to 5 days until the swelling of the canal is resolved and the wick is no longer needed. If there is an ear drum perforation, the only drops that you can use are ofloxacin (Floxin Otic) drops. J. David Osguthorpe, MD and David R. Nielsen, MD. (2006). "Otitis Externa: Review and Clinical Update," American Family Physician, 74, pp. 1510-1516. Robert Sander, MD. (2001). "Otitis Externa: A Practical Guide to Treatment and Prevention," American Family Physician, 65, pp. 927-936. The pain associated starts during a descent of a plane or while scuba diving. Blood may or may not appear behind the tympanic membrane. If there is blood, then this is called either a tympanic membrane hemorrhage or a serous/hemorrhagic middle ear fluid expression. About 10 percent of adults can get barotrauma after a regular flight, making this a very common occurance. How about bleeding in the middle ear, eardrum area following descent to airport following international flight. A day after arrival before head cleared, extreme tiredness and disorientation. Nothing of significance showed on CT Scan. Could there be unknown damage? The problem lies in an increase in pressure verses your eustachian tube. In some adults, a not-so-perfectly functioning eustachian tube has a lot of negative pressure buildup behind it and when subject to extreme pressure, then things rupture inside the ear, typically in the middle ear. But usually these ruptures are of tiny blood vessels that line the walls, and not in any serious location. So unless, you have progressing or lingering symptoms, the most like thing that happened was a pressure rupture of those small capillaries in your middle ear or inner ear... This leads to the symptoms of dizziness (or vertigo, which is greater than lightheadedness) and some mild disorientation. These symptoms occur also in labrynthitis, which is an inflammation in the inner ear. Both conditions resolve by themselves. So the likelihood of there being permanent damage to your ear is low. Temporary damage, Yes. So if your symptoms continue after a few weeks and/or starting to get worse than I highly suggest that you see an Ears-Nose-and-Throat (ENT) doctor. A lot of times it's hard to get that "perfect balance" between user friendliness and visual appeal. I must say you've done a superb job with this. I am using ofloxacin otic solution...the pain is gone, but I still can not hear well at all. My ear feels full of fluid and my jaw aches sometimes. Also, I made a mistake and used these drops in my eyes. It so happens I have some sort of bacterial thing going on with my eyes too. I flushed my eyes, but am still worried. Please let me know. Thanks! I am sorry that you are going through this. Let's start first with your eyes: rule of thumb is that you can use optho or eye drops in your ears but you should never use otic or ear drops in your eyes. The main difference between the two types of drops is that the optic (eye) drops don't have acetic acid in them whereas the ear drops do. That was something that I should have made more clear in my article, but most physicians usually tell their patients that when they prescribe them, so I just assumed it was already being said. So you could have given yourself a chemical burn of the eyes as well as introduced into them bacteria. You need to go to your primary care provider to get your eyes checked for the possibility of it. Second, the fluid behind the ears and the pain in the jaw. The questions are, one: if you knew for sure that it was otitis externa that you had (which the drops are only good for) then were they cleaned of debris and wicks placed before you added the drops? 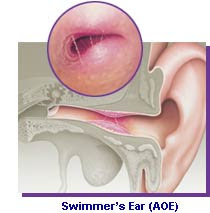 Unless the drops make contact with all skin surfaces, they become useless in treating swimmer's ear. Two: what if what you had was otitis media instead of otitis externa? OM is not treated with drops but with oral antibiotics. Granted it does not normally occur in adults, but there are cases. Three: adults can get a negative pressure buildup that occurs after any ear infection which can send pain down the sides of the jaw and on the side of the neck due to inflammation of the eustachian tube and the neg pressure behind the Typanic membrane. This is usually treated with a nasal steroid like Flonase of two puffs per nostril twice per day. And in severe cases, with tympanic membrane ear tubes being placed. So adults do get tubes placed in their ears, but that is after months of trying with Flonase and things like Singulair or Claritin, and NSAIDs. I suggest you take ibuprofen (motrin) if you are not allergic and have no stomach or bleeding issues, stretch your jaw down and tilting it away from the affected ear, blow up a rubber ballot once a day (strange how it works to relieve pressure), and see a physician for a recheck of your ears and eyes. I wish I could help more but with doing a physical exam on you, I am flying a wee bit blind. Excuse me that was rubber balloon not ballot... It was me trying to type on an iPhone. I apologize. I have seen people talking about the wick making it's way out of the ear. Can it go in further to the point of being unabe to see it? I think the one i had fell out but it still feels like there is something in there. Can u use the green rubbing alcohol? And lastly, Ottis externa conditions are severely painful and yes, it will hurt like Hades when they put another wick in... No painkillers can touch it. But you need a wick in it, with continual drops. Then that wick will eventually fall out or be removed but the next wick will be placed in further until all the skin surface of your ear canal has been treated with antibiotics. One last word, most general physicians don't have a clue on how to treat Ottitis externa because they didn't have ENT training in residency or in school. It's an unfortunate situation, but true. Thank you very much. Going to follow up with that tomorrow. Its quiet upsetting i have liquid coming out and some lite greenish pus now. Which was not there before and means it has gotten worse. Its very scary to know thay we go to the er thinking we are getting help and when in all it doesnt help much. Although after the two calls to them and them reassuring me i didnt need the drops i knew something was wrong when my pain didnt decrease nor the swelling. thanks for the advice. Honestly the first person that has really given me info thats going to help. If i would have never researched it i would be stuck with a progressing ear infection. When you call for the appointment, tell the ENT's receptionist that you wish to speak with the doctor's nurse. Then tell the nurse everything that you have told me, you will be able to get in to see them quicker, hopefully today. And lastly, I am relieved that you did research your condition: some less trained physicians may bellyache about the Internet, but it has been a valuable blessing to patients' lives. Good luck and keep me updated; I am concerned to know how your situation goes. i have extreme vertigo my dr is having me spray fluticasone in my nose for ear swollen shut, 2days ago isn't helping what else can i do? I have extreme vertigo. Dr put me on nasal spray fluticasone 50mcg .Its been 3 days no help whats next what can i do? Has anyone talked to you about Benign Positional Vertigo? I suggest making an appointment with an ENT. The specialist will perform a physical test called the Hallpike maneuver. If you are found to have BPV, which it sounds like you may have, then a few physical therapy techniques will quickly treat your condition. One more thing... BPV is caused by disloged calcium crystals in the otoliths of your inner ear called otoconia. A few physical therapy maneuvers of the head will effectively alleviate the problem. Yet, you do need to see an ENT to make sure that is what you have. There are so many causes of vertigo that I could spend weeks talking about them all. Good luck and keep me posted. Best article I have read on ear infections! I think I have OM. Dr has done the wick thing,after probing out some lovely and painful pus, did i mention it frigging hurt?, the drops took pain away but I still am deaf and feel liquid all the way in my ear. Driving me nuts. I shake my head, lie on the Infected side, and still it will not drain. How do I drain it? I seriously want to jam a needle in it, it's that bad. First you had OE, but now apparently you have developed a fluid buildup from pressure behind the tympanic membrane... Which could develop into OM and you'll get a fever if it has. But right now it sounds like it it a pressure fluid buildup behind your TM. So first thing you can do is put your fingers in the TMJ joint, which is the joint just under your cheekbone at the top of your jaw bone in front of your ear. It is a small indented groove. Put your fingers in it and drag that joint downward and away from the ear. This mechanically drains the Eustachian tube which is the anatomical tube that normally drains the ear. Do that about three to six times. The next technique is to take a pile of baby balloons and blow them up using your mouth. That will alter the pressure within your ear. Also there is a good chance that the fluid may be pus that is still in your ear canal from the OE. If that is the case, the only way to get that out is to use the vinegar-alcohol solution that I included in the post. The vinegar creates the correct pH in your ear that will kill any remaining bacteria, and the alcohol naturally causes your canal to dry out and also kills the bacteria. I hope this helps. Please feel free to email if you have anymore questions. The ENT told me that i have OE. he gave me otic drops ( polymycin B sulfate+neomycin sulfate+dexamethasone) When i put drops in my ear and for a few seconds later i stand then i feel the liquid coming down my ear. It smell like ear wax. Is it the eardrops? Or something else? And may i ask, how minutes do the eardrops to drain in my ear? Dr. Princeton, you're the best! Thanks for a knowledge-packed, straight forward page. if only the whole internet was as well-written and thoughtful as your website! I've got a question, though. I've got an appointment in a few days with my ENT for my OE but the swelling is pretty awful. Could I use Flonase in my ear since it's a steroid too? I'd love to be able to hear again. Thank you very much for this article! 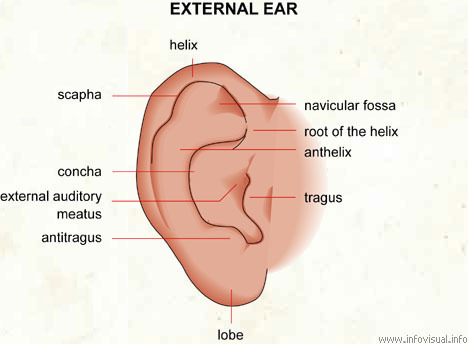 It is by far the most information on swimmers ear I've found! My 10 yr old son was diagnosed with swimmers ear on Sat Aug 3rd. He was prescribed Neomycin with polymyxin B-ydrocortisone. On Sun the pain was so bad that he was also prescribed Hydrocodone/Aceteminophen to be taken every 4 hrs. On Mon his ear was worse so we went back to the doctor and was told the ear canal was full of mucous and then prescribed Azithromycin and Ofloxacin and another bottle of pain meds. He's had 4 doses of the Ofloxacin and 2 of the Azithromycin and so far no change. My son has state funded health insurance so we have to go where we are told and the doctor he was assigned to spent approx 3 min with him on each visit. He was out the door before I could even think up my questions. So I'm hoping you will be able to shed some light on this for me. 1) at what point should we ask to be sent to an ENT. 2) why would he be given medicine for both outer and inner ear infections (he hasn't run a fever or had any type of cold or any other symptoms other than ear pain) and 3) is it okay to use a heating pad on low on his ear to ease some of the pain? (we have done this with inner ear infections in the past) Any information you could give me would be greatly appreciated! The majority of old school Primary Care Physicians haven't had ENT training since their residencies, so the treatment of otitis externa has been forgotten so to speak. What's happening in your son's case is that his infection is persistent. The problem is that he does now need to go to an ENT and have a wick placed... Hurts like a monkey. But it's the only way to treat it: the medicine needs to touch the surface of the ear canal and right now his ear is swollen. Yes, you can use a heating pad to warm it. My seven year old daughter was given a wick in her ear on Friday. The swelling went down the next day and the wick went deeper into her ear. I took her to have it removed on Monday. The dr wasn't able to fully remove it. I'm worried. Do you know if this will cause future problems? She is in no pain, but I can't help but be worried. Daughter had swimmers ear 3 times 4.5 weeks ab drops all summer. Had the wick the second time. Each time I saw fluffy white gunk in there and it blocked her hearing and she said it felt like water was stuck in there. Finally we were cleared...saw yellow wax...which was such a relief! We have avoided swimming for weeks. Swam last week once...and the next day...it hurt and we started the ciprodex. After a couple days I realized the drops were not going in...maybe after laying there for 15 minutes...too much white gunk blocking. Went to pediatrician...different doc. He scoop some out and said her ear drum may have ruptured due to the white gunk....I explained she always gets the white stuff...looks fluffy than after drops it looks sticky? White gunk never was runny...very thick. Anyway...he put her on an oral ceflesporin and said to finish drops. See him in two weeks. We r done with drops and day 5 pf antibiotic. Still white junk in there and I know if water gets in there...it will get stuck? What should we do. Ent asap or just go back. Ear is not bothering her but she says it feels weird sometimes. Doctor always prescripts eye drops for swimmers ear are these available over the counter? Thank you for publishing this article and sharing such useful information! Ask most, I am in this situation, and am seeking guidance as well. I had ear canal itchiness off and on for a week or so. I was wiggling fingers in there to help, but that escalated the problem to swelling in one of my ears. I stopped touching it, the swelling disappeared. When the itchiness came back, I stupidly did the finger wiggle again... Now my ear is swollen. I went to a walk-in family practice and was told I have swimmers ear. I told the doctor I would be away in Jamaica for the week at a wedding, so he have me two prescriptions. An antibiotic drop with a steroid (ciprofloxacin hcl/dexameth) Ciprodex, and an oral antibiotic cefprozil. I was told to take the drops for three days, and if there wasn't an inprovement, to take the oral meds. I have otitis externa and I went to the doctor three days ago. The wick just came out. Its Sunday night so I can't call my doctor. My question is, do I continue to use the drops and just cover the ear with a cotton ball? Thanks.